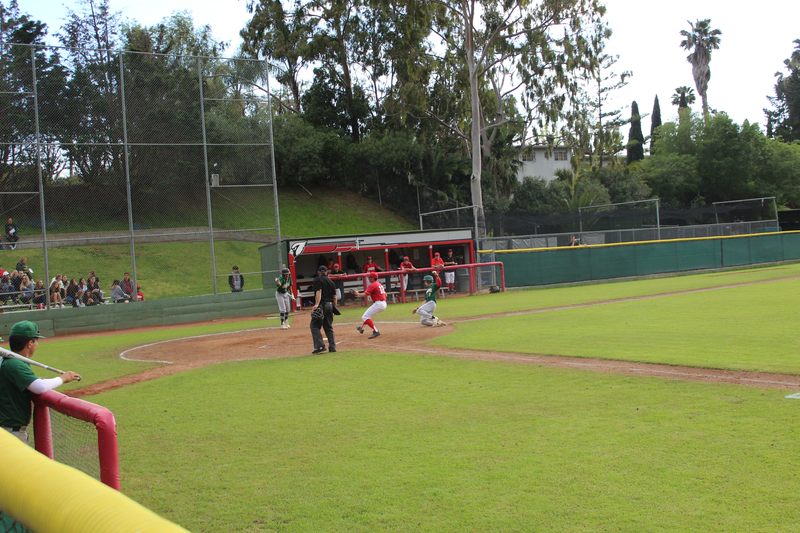 Dylan Gray slides into home plate after Bishop Diego wild pitch. The move up from the Frontier League to the Tri-Valley League this season has provided an upgrade in competition for the Bishop Diego baseball team. After a strong showing in non-league games, the Cardinals have taken their lumps so far in league play and visiting St. Bonaventure added to their woes with an 8-0 thumping on Wednesday afternoon. St. Bonaventure starting pitcher Jake Saum, a UCLA signee, riddled the Bishop Diego lineup and surrendered just one hit with 10 strikeouts in 5 1/3 innings on the mound. The Cardinals put two runners on in the bottom of the first inning after Ashton Pelley reached base on a sacrifice bunt that the Seraphs failed to field, but the scoring opportunity quickly fizzled as Saum was able to settle in. Gabe Arteaga got the start for Bishop Diego and kept his team close through four innings. St. Bonaventure left a total of seven runners on base through the first four innings as Arteage repeatedly pitched himself out of jams. In the top of the fourth inning, St. Bonaventure loaded the bases with one out before Arteaga struck out Jake Saum and Charlie Saum to keep the Bishop Diego deficit at 1-0. Gabe Arteaga held the St. Bonaventure offense to one run through four innings. The floodgates began to open for St. Bonaventure in the top of the fifth inning. Omar Gastelum led things off with a triple to the center field fence and scored on a sacrifice fly to left by Cullen Moes. Eric Starna followed with a single through to left field, moved to second on a sacrifice bunt by Jacob Castaneda and scored on a single through to center field by Dylan Gray, chasing Arteaga from the game. Gabe Martinez came on in relief of Arteaga and Gray scored on a wild pitch increasing the Seraphsâ€™ lead to 4-0. Bishop Diego (9-4-1 overall, 0-3-1 Tri-Valley League) threatened in the bottom of the fifth inning after Nico Sanchez reached base with two outs on a third strike in the dirt and Buddy Melgoza followed with Bishop Diegoâ€™s only hit of the game, a lined drive to center field. The next batter, Isaac Medina came in to pinch hit, but struck out swinging. St. Bonaventure added four runs in the top of the sixth inning to take an 8-0 lead. A two-run homer to center field by Charlie Saum was the highlight of the inning. The two teams will meet gain on Friday at St. Bonaventure beginning at 4 p.m.